Home › Golf Clubs › What is the Best Mallet Putter? When picking your ideal putter you should pay attention to your stroke style. If you have an inside-to-inside putting stroke, a blade putter, normally toe balanced, will probably work best for you. If, on the other hand, you have a straight-back-straight-through putting stroke, you should go for a mallet putter which is normally face balanced. Mallet putters have increased MOI (Moment of Inertia) which works best with that putting stroke style. The immaculate white finish on Pinemeadow Golf’s PGX mallet putter really makes it pop against the backdrop of the green grass. You will have no problems lining up the ball to the alignment lines on the putter head. The putter is “tour-weighted” at 380g, 40g more than other putters, making it well suited for the more common faster greens. Putts are smooth with even forward spin and less skid making for a nice stable putting game all-round. The weight is well balanced; however, there is a lot more power compared to a traditional blade putter. We suggest you practice with it at the range before taking it onto the course. The extra power will surprise you and you could end up overshooting the cup without striking any harder than you are used to. It comes with a very handy custom PGX headcover, which you may want to use since some users report that the white paint finish is prone to chipping if left unprotected in your bag. For a mere $40, this is one of the best deals on the market today! If you are looking for a great mallet putter, then makesure you check out the Pinemeadow PGX! 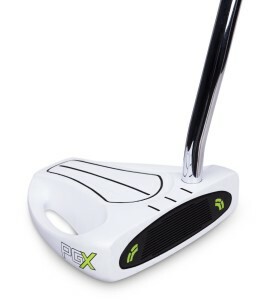 Buy the Pinemeadow Men’s PGX Putter here! 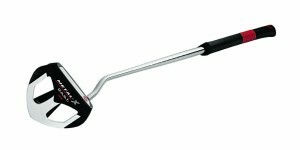 This mallet style putter from Wilson has soft-feel grip designed just for Wilson and the grip is larger in diameter. The grip is quite stylish with the vertical seam design. It has a unique and very comfortable feel the moment you pick it up. The face has multiple density areas in the micro injection insert. It is well balanced, although it is not as heavy as it may look at first glance. The weight is not that much more than that of a blade putters. If you are a beginner and on a budget, this is one of the best mallet putters you can buy yourself. 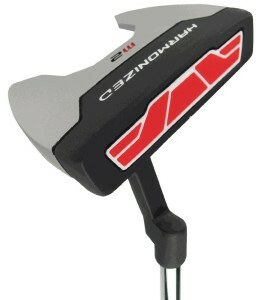 Buy the Wilson M5 Mallet Golf Putter here! The Odyssey / Callaway brand is well renowned for making the best putters on the market. Their Odyssey Metal X Dart is available in three shaft lengths: 43”, 48” and 50”. It features a Metal-X insert with a lightweight aluminum outer layer with oval depressions that take full advantage of the automatic lock with the golf ball dimples. This creates a lower takeoff with improved top-spin for less skidding and the most accurate roll available. The club head has a midnight black finish created by a high tech process that results in a long-lasting, glare lessening surface. Optimized weights in the sole create an ideal balance to get the best feel, control and precision on every stroke. Buy the Odyssey Metal X Dart Long Putter here! Not worried about spending a bit cash? Then the Smart Square Heel Shafted Mallet Putter by Cleveland Golf could be the best mallet putter for you! It looks fantastic with its jet black colorway, and is available in 33”, 34”, 35” and 39” shaft lengths. The Dual Axis Alignment features help you get perfectly aligned to the ball, and two perpendicular lines immediately inform you if you are hitting the ball square or not. This makes accurately setting up your putt much faster and simpler than most other putters. Thanks to the Consistent Roll Co-polymer face insert every stroke has an improved sound and feel and it produces a smooth and accurate roll with enhanced distance control. The specially designed head ensure that your putt rolls the right distance, even on off center hits. The Cleveland Smart Square looks great, and is easily overall one of the best mallet putters available. If you are not a beginner, and don’t mind spending $140 on your putter, then this is money well spent! 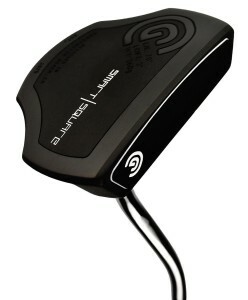 Buy the Cleveland Smart Square Mallet Putter here! Truly not worried about your budget? Then check out this beautiful mallet putter from TaylorMade. The Spider Mallet putter comes in two shaft lengths: 35” and 38”. The design is truly amazing with exquisite attention to detail. The lines, curves and color combines to make this putter as close to a work of art as you can get with a mere putter. The combination of the white topline and the mirror-black ion-plated sole is very eye catching. Feedback and smooth ball roll is excellent thanks to the new ‘Pure Roll’ insert made from 80% Surlyn and 20% aluminum. An accurate aim is assured by the high contrast topline and bold parallel lines on top. Improved grip and feel is provided by a premium TaylorMade grip. The grip is 130 grams and perfectly counterbalances the heavy head which has incredible heel-toe weighted stability. The increased MOI lets you control the club and keep it on your intended line for improved put accuracy. 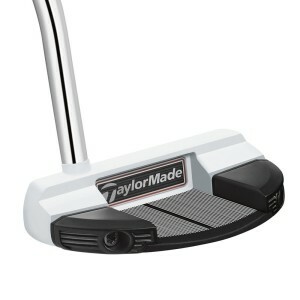 Buy the Taylor Made Spider Putter here! Ready to shave strokes off your score? Then pick one of best mallet putters available and start improving your putting game! ‹ What are the Best Women’s Golf Shoes?